Enzo Life Sciences is proud to introduce our new assay, PLAQPRO™ Lp-PLA2 Assay, measuring the activity of Lp-PLA2 in vitro. Lp-PLA2 is produced by inflammatory cells and circulates primarily bound to LDL. The oxidization of LDL is an early key event in the pathogenesis of atherosclerosis. Increased levels of Lp-PLA2 have been found in atherosclerotic plaques and rupture lesions. The PLAQPRO™ Lp-PLA2 Assay is a colorimetric readout assay that measures the activity of Lp-PLA2 in serum samples. Our assay represents a cost-efficient alternative to the competitor’s Lp-PLA2 detection system, and is designed to run on automated chemistry analyzers. Included in the kit are ready-to-use calibration standards and QC controls in order to measure a wide analytical range of 0.0 – 400.0 nmol/min/mL of Lp-PLA2 activity. PLAQPRO™ Lp-PLA2 Assay is the latest in Enzo’s line of cost-effective, highly adaptable, and high performance products and kits. 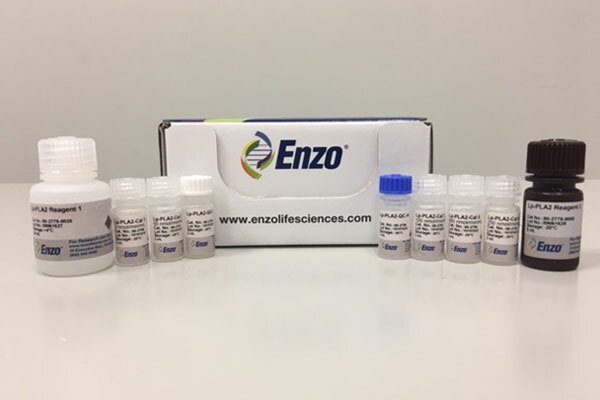 This assay represents another addition to Enzo’s considerable portfolio of cardiovascular products, including Troponin I, CRP, Cytokine, and Adiponectin ELISAs, our Cardiotoxicity Library, and many proteins and antibodies to detect and measure vasodilation and vasoconstriction.